With less than 10% of the hardwood used in the UK being home-grown, have we fallen out of love with UK hardwoods? According to the latest Forestry Commission Statistics, the UK consumed just under 460,000m3 of sawn hardwood timber in 2015. Of this we calculate that 425,000m3 was imported with only 34,000 m3 (7%) from home-grown sources. This could make you think that we just don’t like the species of timber we grow in the UK? However when you look at the types of hardwood timber being imported, we can see that only 76,000m3 is classed as tropical hardwood. When you look at the species being imported from the EU, they are all temperate species that grow in the UK, such as oak, ash, beech, cherry and poplar? Oak is by far the most popular species imported, with 175,000m3 being imported into the UK from Europe in 2015. If you add to this the estimated imports of oak from outside the EU, as well as the estimated 40,000m3 of home grown production, the total amount of oak consumed in the UK could be in excess of 300,000m3, or two thirds of all the hardwood timber consumed. So we have not fallen out of love with the species we grow, but it does look as though we have lost sight of the other species available to us! So why is it that the nice new sideboard we have ordered is likely to be made of oak, and this is unlikely to be from the UK? Oak in particular has always been seen as the iconic British timber; our navy and many of our timber framed buildings were built on the supply of ‘English’ oak. However over the years demand has outstripped supply and we have had to look elsewhere for oak. Significant quantities of American white oak have been imported over the years, which is very similar in appearance to our European ‘English’ oak, but the price could be up to 40% cheaper! We now also get significant quantities from both eastern and western Europe, and also from Russia and the Far East. In addition the material supplied is of a consistent quality in a form that the manufacturer or joinery company can easily work with, such as random width square edge boards, which at one time the UK saw mills were not set up to supply. This has led to a slow decline over many years in the quantity of UK oak processed, and the other species such as ash and beech, meaning the woodlands these were sourced from in the UK have fallen out of management. So how do we fall back in love with our home grown timber? First we need to ask where our timber is coming from, and be sure that all supplies are from responsible sources. This can be achieved by asking for FSC or PEFC certified timber. We should also be creating a demand for our home grown product, so also ask for it to be Grown in Britain assured and look for the logo. By asking for Grown in Britain assured hardwood you are creating demand, which will help bring woodlands back into management, and incentivise the planting of new woodland, so we can become more self-sufficient and get the UK nearer to the European average of 37% forest cover, from its current 13% forest cover. The recent fall in the value of the pound has also made imports more expensive, meaning UK timber is now very competitively priced. Secondly we need to get away from our obsession with oak and appreciate the beauty of other species. 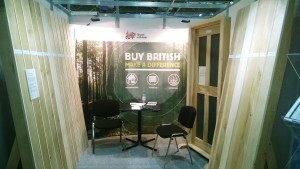 At Ecobuild in March 2016, Grown in Britain displayed a number of UK sourced hardwood, including ash, sycamore and sweet chestnut as well as oak. All of those visiting the stand were impressed with the quality of the timber on display, with a number saying “It’s great to see that species other than oak are available.” For example we have significant supplies of sweet chestnut which is a great substitute for oak in a number applications as it looks very similar, and has similar durability qualities. In addition we have significant quantities of ash, due to the effects of ash dieback, which is a great timber for internal joinery, as is sycamore. Last but not least we need to fix our inefficient UK supply chain, and this is something our Grown in Britain WoodStock Project has been looking into. This Innovate UK funded project found that we could replace the majority of imports if we looked at using species other than oak, and that a consolidated supply chain could provide the consistent quality the UK merchant industry now demands. The final report for this project is available on the Grown in Britain Website. If you would like us to help you with your responsible timber procurement, or help you obtain a Grown in Britain licence, please Contact Us.